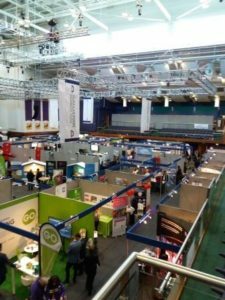 Our fundraising team visited the Gloucestershire Business Show 2017, The Door’s Fundraising Coordinator Annabel tells us about their day. Known as #GBS17 in social media language. This event is more than a conference and more than an exhibition and all held in the excellent spaces of the Cheltenham race course. It’s a platform on which to discuss, learn, and collaborate – where you can make new connections and develop innovative thoughts. It’s for all businesses: from international corporations to micro and start up businesses and all in between. It’s for all sectors: from engineering to low carbon; accountants to farmers; craftspeople to exporters. As a fundraising team of three it was the perfect opportunity to engage on an informal level with the very best of local business. With over 100 stands we truly immersed ourselves in the heart of Gloucestershire entrepreneurs for the day. Highlights included meeting the founder of the Wychwood Festival and trustee of Toybox, Sam Shrouder, meeting the Breeze radio team, enjoying viewing unique 3D printed data models from mathematical brain of Dr Chris Tofts (ORDVIT) and talking sustainable energy and the exciting innovative possibilities presented by the team at TESLA. We are already looking forward to meeting with ASGuk Security, MRG Systems and World Pay to see how we can work together. Each and every conversation was useful, varied and energising. And of course, an opportunity for us to explain why and how we do what we do. Networking at its very best.